Raspberry chocolate chip balls and other yummies will be available at the Transfer Station in exchange for a donation to Bay Path Humane Society this Saturday morning. Fifth Grade Girl Scout Troop #72770 will be near the swap shop from 8am until their stock runs out. Scout Haley Michel proposed the idea of asking for donations in any amount instead of charging a set price and the rest of the troop agreed. The girls chose Bay Path from a long list of organizations. 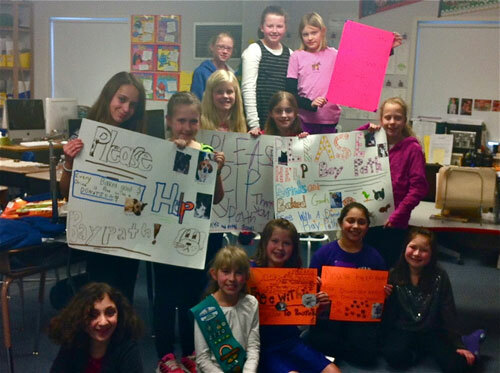 Bay Path sent two volunteers to a scout meeting at the Neary School where the girls helped name orphan pets and assembled dog treats. The bake sale is part of the girls’ work on their Girl Scout Bronze Award. Other treats for sale will include blonde brownies, cranberry white chocolate chip cookies, oreo pops, baby cupcakes,chocolate chip cookies, rice krispie treats and butterscotch chip brownies.